Reader TheLordFlasheart made the excellent suggestion of comparing similar outfits worn by different James Bonds throughout the series, so I had to find two outfits that I think could be compared fairly. I’ve chosen to begin with comparing George Lazenby’s and Roger Moore’s button three double-breasted blazers. These are the only two Bonds who have worn this naval-uniform-like blazer, and they wore them only five years apart. Considering Bond’s background as a commander in the Royal Navy, this is a very appropriate style for the character. In the naval tradition, both blazers have metal buttons, and both have silver-toned buttons rather than the ordinary brass. Though both blazers are English-tailored, neither have straight, uniform-like shoulders. The shoulders have less padding than military uniforms do for a more natural and civilian look. Roped sleeve heads are typical of the military style, and whilst Moore’s blazer has a little roping, Lazenby’s blazer doesn’t have any. Both blazers, however, have a clean and fitted military-like cut through the body. The two blazers have the appropriate detail of double vents, though both also have the then-trendy detail of slanted pockets. Slanted pockets are also known as “hacking pockets” because of their equestrian origins, and the blazer’s origins are quite far from that. That makes slanted pockets an unconventional choice for a blazer—especially a double-breasted blazer—but it was nevertheless a fashionable choice. Though unconventional and trendy, I rather like the rakish slanted pockets. Lazenby’s blazer adds a ticket pocket. Some aspects of fashion had changed significantly between On Her Majesty’s Secret Service in 1969 and The Man with the Golden Gun 1974. As far as the blazer is concerned, those differences are in length and lapel width. Though Lazenby’s single-breasted jackets have medium-width lapels, the double-breasted blazer has narrow peaked lapels similar to those on a Royal Navy uniform. Roger Moore’s blazer has wider lapels, but since it’s double-breasted the lapels don’t proportionately look too wide. Lieutenant Hip shows how ridiculously wide double-breasted lapels could be in 1974, with the points only about a quarter-inch from touching the armhole. Lazenby’s blazer is slightly shorter than Moore’s traditional-length blazer, which was a trend in the late 1960s. Moore’s blazer has a slightly narrower wrap than Lazenby’s blazer, which was the way Moore’s tailor Cyril Castle cut double-breasted jackets and didn’t reflect any particular trends. Lazenby’s blazer adds the sporty detail of swelled edges, whilst Moore’s has the unique link-button cuffs. Trouser leg width changed more than anything else between 1969 and 1974. We don’t see much of the trousers that Moore wears with his blazer, but it’s assumed he wears trousers with a slightly flared leg. Lazenby’s trousers are very narrow with a straight leg, though they are still neatly tailored. Lazenby’s trousers are light grey and Moore’s trousers are charcoal and white, respectively. Frank Foster made both Moore’s and Lazenby’s shirts. Moore wears his blazer with a blue and white mini-Bengal stripe shirt and a white shirt, whilst Lazenby wears his blazer with light blue and pink shirts. Lazenby’s shirts have a narrower collar than Moore’s shirts have, and the collar choices were probably what Foster or the costume designer through looked best on the actors rather than what fashion trends dictated. Lazenby’s shirts have single-button cuffs whilst Moore’s shirts have cocktail cuffs. Lazenby’s ties are medium-width navy and red knitted ties, and Moore’s ties are wide slate blue satin and white and navy striped. The tie width, of course, matches the lapel width. Though Lazenby’s look would certainly look more fashionable today than Moore’s would, I think both Lazenby and Moore wear their blazers very well. Both dress in good taste and neither commit any sartorial sins. Who do you think wore the button three double-breasted blazer better? My vote: Lazenby. On Moore it looks like he’s playing dress-up, somehow. I think this nails it in general for Roger Moore. He’s a fine actor, but still an actor. When I really observe I become aware it’s a costume, not an outfit. Here OTOH is a good example of why I like Lazenby. It looks like he wore his own clothes to work. He inhabits the character well, and the trappings of it are an actual part of him. But for Moore it wasn’t costume. He wore the same exact clothes in Bond as he did in real life. If you watch him on a talk show from the era, or see any photos of him off the set, he’s wearing the same clothes. 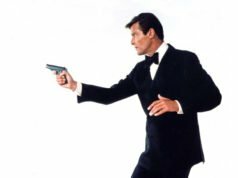 His personal tailor and shirtmaker made him his Bond clothes. What you said is correct; furthermore, it was Lazenby who had to be taught how to dress and how to walk by director Peter Hunt. Even though he had been a model, he certainly wasn’t effortlessly dapper in real life, and still isn’t if you see any of the more recent interviews. His physique and natural grace helped, of course. How Lazenby walks through the room to M seems to me prol juvenile, bobbing up and down. Both of these jackets are great. I actually prefer the overall cut of Moore’s blazer, although I’m not mad about his tie in the scene you picture (the slate blue tie is better). Therefore, even though I prefer Roger’s blazer, I have to give higher marks to Lazenby’s overall outfit. As an aside, I think these comparisons are going to make for very enjoyable reading/discussions should you continue to include them in your blog. I vote for Lazenby’s as well. Even though the fit is great, there is something of the ‘Brett Sinclair’ about Moore’s blazer. My vote is for Moore on this one. I actually like the slightly wider lapels on his DB jacket. And although both jackets are cut quite close to the body, I think Moore’s jacket seems more relaxed, I would imagine wearing it would be more comfortable than wearing Lazenby’s. However, like FS, I also like Lazenby’s overall outfit much better. The pink shirt/navy knit tie is a combination I like very much and often wear myself. Well yeah, it will never match exactly. But I don’t think it needs to. Some people may think it’s a faux pas but I kind of like it. I even like the monochromatic navy jacket/light blue shirt/navy tie look that Connery wore a few times. I find it minimalistic and elegant. Besides, with a knit navy tie you get the difference in textures. The shlubby texture makes it stand out more. I admit a smooth satin tie would probably not look as nice. These are two of my favorite outfits from the entire series – how I wish Craig would wear something similar! In terms of comparing the two, Moore’s outfit is slightly more theatrical, but it works for him, especially given the exotic setting. I also think his shirt collar is more elegant, and (I know there will be disagreement here) I REALLY like his tie. The ensemble works very well with his coloring and complexion. Nothing wrong with Lazenby’s outfit, however. I like it better with the pink shirt he wears with it in the “Hallmark card” montage. Too bad that with his stature, Craig’s would have to be a button-two. Lazenby looks effortlessly stylish, Moore’s outfit just strikes me as a little ostentatious and the tie is too loud for my taste. His blazer is more proportionate and clean. Liutenent Hip is a perfect exemple of the horrors of 70s; those lapels are simply monstrous. 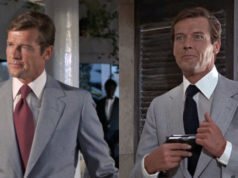 But the suits of Roger Moore in “The Man with the Golden Gun” are overall rather classic,and dated only for the huge ties and for the shirt collars. In my opinion is the 007 movie in which more is best dressed. I like especially the double breasted worn in the M office…Is not Bond neither a little,but is a beautifull suit. I’d say Moore’s collars in The Man with the Golden Gun are hardly dated. They are on the large side, but not like the collars from The Spy Who Loved Me. They look proportionate with Moore’s face and body. While George’s is definitely more modern and classic all the same, I kind of prefer Roger’s. I like the way the jacket fits and the ensemble seems more regal. Lazenby’s, in its simplicity, is slightly more Bondian, but Roger’s seems a little more luxurious. Not that I prefer the flared pants, but we all make concessions to the era we live in. Although very well cut (especially as seen from the back), I do prefer Moore’s blazer: much better shaped roped sleeve heads, which tend to be more ‘pagoda-shaped’, shiny silver buttons and deeper vents. Am I biased by my own preferences ? Interestingly, whilst Moore always had a somewhat stiff posture, especially his shoulders, which he seldom moved, he looks more relaxed in his clothes. On the other hand, when Lazenby enters the room, he seems to adopt the other extreme of the ‘gestual specter’. I am nevertheless very grateful for the blazer/pink shirt/navy tie combination, though, which is a source of inspiration, as well as most of the clothes he wears in this movie. Apart from the orange golf attire, the off-white slip-ons, and the day cravat. Not to mention the absence of a proper morning dress. I’m thinking Matt should devote a post to M’s stylish outfit in Stan’s clip. Agreed ! As a matter of fact I consider every outfit M wore great until Diamonds are forever, where they start to become less interesting. I don’t know about Lazenby’s entrance into that room, but how he crosses it is ugly. It’s difficult for me to comment as I’ve only seen The Man With the Golden Gun once (when I was a kid I thought that Moore was the anti-Bond). I’m largely going off of the images here, although until Casino Royale came out On Her Majesty’s Secret Service was my favourite Bond film so I’m very familiar with Lazenby’s wardrobe. Based on the pictures here I much prefer Moore’s blazer. I think that it largely has to do with the proportions. Moore (at least in the picture) has some nice proportions between his shoulders, chest, and waist. This is what good tailoring can achieve, as in many ways Lazenby could be judged as the one who was in “better shape”. But looking at Lazenby’s blazer it’s much more straight in an up-and-down way. Somehow it looks more constricting to my eye, which Lazenby’s single-breasted suits avoided. So while I do appreciate many of Lazenby’s outfits, Moore’s version is more aesthetically pleasing to me here. This was an interesting comparison as there wasn’t a huge gulf between the styles of outfits. It will be interesting to see outfits with a large number of years separating them (Connery’s black polo/black pants combo in Thunderball and Dalton’s similar outfit at the end of The Living Daylights). I’m keen to visit similar takes by the same actor on a certain look (Connery’s all black “sneaking around” outfits in Goldfinger and Thunderball; Brosnan’s three tan/cream linen suits in GoldenEye, The World is Not Enough, and Die Another Day). I’m going to do some comparisons that are farther apart, like different takes on similar ideas. It would be much different to compare Connery’s polo with Dalton’s, since I think almost everyone would agree that Connery does it better. It would be like how to and how not to wear something. Similar looks amongst Connery’s or Brosnan’s wardrobes would be a fair comparison. I’ve thought about comparing one of Connery’s suits from Dr. No to something similar in Diamonds Are Forever to show how much it changed over the years. I love both of these blazers, they’re both fantastic! My vote would have to go to Moore, however, the only reason being the lapels. The larger lapels just look cleaner on a double breasted jacket than on the thin ones on Lazenby. This was a tricky one though, Lazenby and Moore are my favourite Bonds when it comes to fit. It’s very close. They’re equal but for the inch or to of the lapel. Shouldn’t the last button on this 3-button blazer be left unfastened? Is it appropriate to button up all the 3 buttons? I always thought that whatever style the jacket may be, the last button should always be left open. The bottom button on a double-breasted jacket may be fastened or left open. When jackets are cut straight down all buttons can be fastened. That’s the case on double-breasted jackets as well as on army/air force uniforms and norfolk jackets. On Moore’s standard button 2 double-breasted jackets he leaves the bottom open. But on this button three double-breasted style I think it’s best that the bottom is fastened since it’s so much like a Royal Navy reefer, and uniforms are always buttoned all the way. Stole the words I was about to type. Thanks for the question. I think that the lapels on a button three double-breasted (or “Edwardian reefer”) should not be large,but more on the narrow side. High button three double-breasted with large lapes seem unbalanced and little harmonious. Both blazers look quite excellent. I have never been a fan of button three but these shots have changed my mind. Lazenby’s more sporting and informal, Roger’s more classical. Both are examples of differing styles but both are elegant and timeless. In other words, how a gentleman should always dress. Hear, hear! I can’t believe that there are fashionistas out there who still argue that DB blazers are “old mannish” and uncool! I plan to wear one to my 35th college reunion – I just wish I could find a button 3 style! Sir Moore wore it better. In my opinion, if one is going to wear a blazer with 6 buttons on the front then they should own the look and accentuate it with flashier buttons. Personally I dislike everything about Moore as Bond; as a Fleming purist, I feel he was never actually playing Bond but rather someone else with that name. However, I would agree that his blazer here is probably the most comfortable of the two. Lazenby’s single breasted suits are much better on him that this double-breasted affair. I’ll pay it to my fellow Aussie, Lazenby, but just by a whisker – they’re both grand blazers. The OHMSS ensemble just seems a little more sedate or subdued and thus less stand-outish. Of course, both outfits scream “naval officer” and if memory serves Bond only wears them when reporting to M.
Lazenby wears his off-duty as well as when reporting to M.
I, too, was always a little disappointed by the shirts Frank Foster made for Lazenby. I assume he was trying to balance his broad face with narrower straight collars, but the shirts just looked sort of “meh” compared to the fashionable, sharply tailored suits that hung so well on Lazenby’ s frame. Come to think of it, judging by the collars, Lazenby’s shirts look like something off-the rack. Would someone be so kind to appraise Lazenby’s blazer buttons? 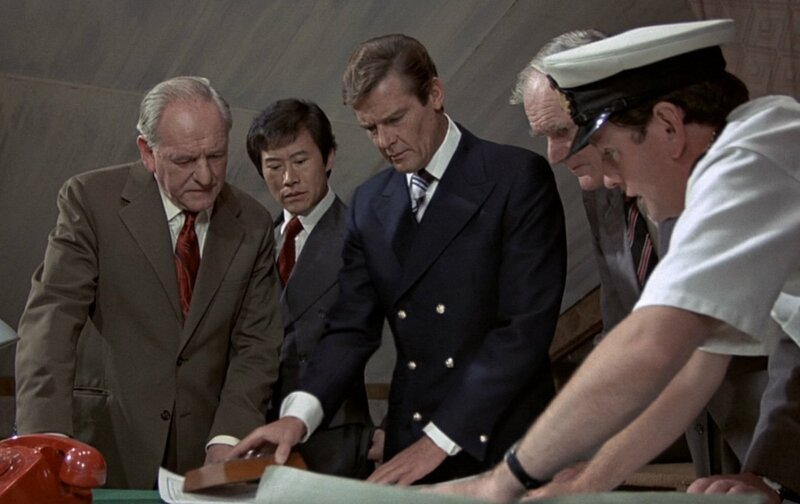 Hi Matt – what is a link-button cuff in the Man With The Golden Gun blazer? Does it mean that the cuff just has one button? I take it that all the buttons in this blazer are polished brass? Thanks. Thanks Matt. From the pictures it looks like Roger Moore’s blazer has brass/gold buttons but your post says they are silver toned. Kindly clarify. George Lazenby’s definitely look like a dull silver and flat (not domed) whereas Roger Moore’s look like the conventional domed buttons that blazers have. Do you think either of them would have any engraving on them like blazer buttons usually do? Thanks again. Moore’s buttons are shiny silver. They do not look brass in the image posted here. There may be an engraving, but it is difficult to tell. The only thing black essential in a man’s wardrobe is a few pairs of black shoes. Black blazers have no place in a man’s wardrobe.